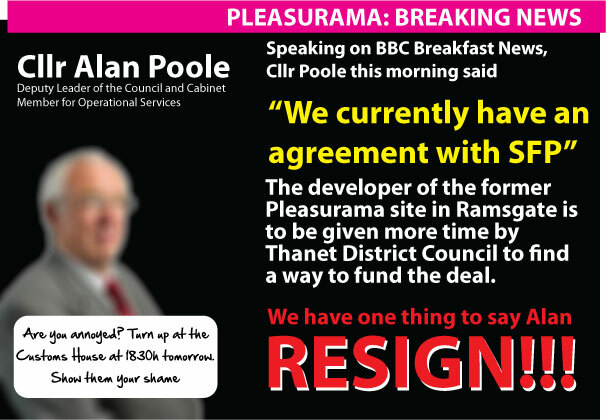 Reading through today's local paper, it's all becoming a little heated over in Ramsgate, following Councillor Poole's most recent interview on BBC Southeast News. There's even a new Facebook page, InTouchwithThanet, which is turning out the kind of imaginative satirical comment on local politics, seen above. 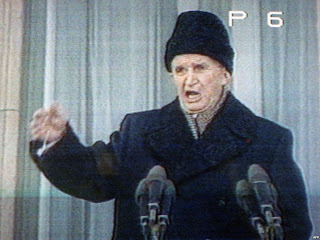 I wonder, does anyone recall that iconic moment in recent European history, when the Romanian socialist dictator, Nicolae Ceausescu, stood on the balcony of his palace in Bucharest and unsuccessfully attempted to convince an angry and resentful crowd that shooting him and his wife, Elena, wasn't such a good idea? While many readers may be in favour of shooting socialist dictators or even socialist councillors, it's considered politically unfashionable. I for one am not convinced that such measure would solve all or indeed any of our problems; although I do recognise that it might sound attractive if you live in Ramsgate. Having read Clive Hart's platitude-filled column on recharging the local economy, in today's Thanet Gazette, I have to draw the conclusion that he's a victim of wishful thinking, quite detached from the harsher economic realities of our time. But what else might you expect from a Council Leader and his Deputy, charged with managing many millions of pounds of council taxes and government grants, where I see no evidence of a career record of management or responsibility beyond trades union activism, and loyal, plodding and unimaginative membership of the Labour Party? Representative democracy may be a wonderful thing but only too frequently this delivers individuals into roles of influence and power, who are quite unsuitable for positions of public trust. 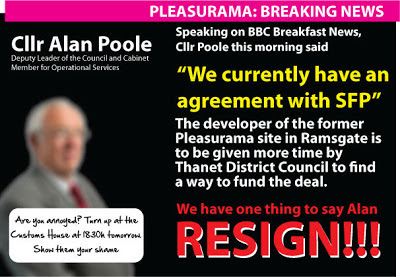 Thanet, has sadly suffered to much in the past and continues to suffer into the present with the Faustian bargain with TIG, which keeps Clive Hart's inept, minority Labour administration in control. What's next I ask? Given the breadth of possibilities, I really can't say but I'm reasonably confident that we won't reach the autumn before the travelling circus, that loosely describes the political leadership of our Council, will drop the ball again. What irks me though is that our openly transparent administration makes it very difficult to discover the facts, as I either find out about problems around the same time as Eastcliff Richard or independent Cllrs John Worrow and Jack Cohen block any attempt in Council to hold the present administration to account. Simon, You can be more than reasonably confident that Hart and Poole will drop the ball again before the Autumn. It is an absolute certainty. Has anyone calculated what Hart and Poole in particular have cost us since they hijacked power with the help of two little men who put personal grudges before principles. Simon - the blue part were not open at all on Pleasurama nor TEF. Labour have made a spectacular failure on both by falling into the same trap. If an election were held today in Ramsgate, none of the above would win by a landslide. Oh, sorry, forgot, they did! Still, UKIP is not such a bad place for you all to go though is it? 10:13. Worrow's outburst was covered in the previous week's edition of the IOTG! You're right of course 7:05, I clearly forgot.